Reasons for Inclusion: Lesbian characters. Laret is trans and brown-skinned. Poly relationships are common (Aesa has three parents). In Aesa’s world, men and women are warriors or witches, or thralls, common people bound to fate. Those who want to be more than thralls seek glorious destinies, but sometimes it isn’t as simple as they hoped. Aesa has worked for years to be taken on by a thrain and join a raiding ship. She finally wins her chance when the glorious Gilka chooses her, but her lover Maeve is left behind. As Aesa’s journey continues, the reality splits even further from her dreams. 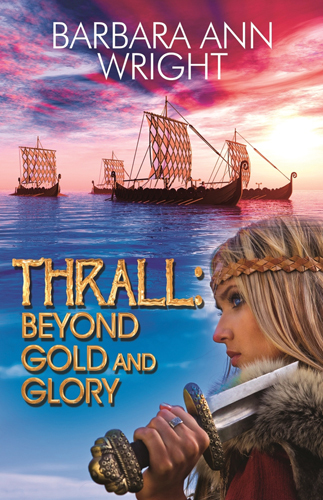 Gilka’s ship travels to a mysterious island to seek battles and treasure. They find fae on this island, and the human population split into two classes: the ruling shapti and the docile, passive fini. Gilka wants to fight, plunder, and leave, but Aesa can’t help but see the injustice. Is this what being a warrior is, following orders to murder and steal while leaving these people to suffer? Especially people like the fini, who can’t even choose their destiny as Aesa’s people do. Aesa’s struggle, and the struggles and growth of the other three protagonists, were what really drew me into the story. Maeve, the healer Aesa left behind, is a healer witch. But she doesn’t have a wyrd, the special magic ability every witch has. The community doesn’t see her as a true witch without one; she has no chance of joining a thrain’s crew. And when she meets Laret, she must balance her love for this new woman against her old love with Aesa, and her ruined hopes of a life together. Laret has spent her whole life trying to be recognized as a woman. While Maeve’s people are far more accepting of her gender than her the people of her home country, it’s not the only thing that sets her apart. Laret is a blood witch, controlling powers that can be used to set evil curses. Though she uses this power to break curses set by other blood witches, some people still fear her abilities. And then there’s Ell, a fini slave on the strange island. For all her life, she’s accepted her place serving the shapti and never even experiencing strong emotions. Aesa’s appearance sparks curiosity in her, and she begins to question her people’s way of life. Can the system of shapti and fini be overcome? What will happen if it is? And is that really what’s best? In their adventures, the women must wrestle with issues of freedom, loyalty, and justice. The characters were likable, the issues complex, and the battles were exciting. I really enjoyed this book and I highly recommend it. Well written review! Great summary while also emphasizing the main conflicts and underlying themes.